I wanted to make you aware of the upcoming plans in Johnston County concerning mosquito treatment that will be occurring in approximately the next 3 to 8 days weather permitting. Bryant Spivey (County Extension Director) and myself have made sure that beekeepers' concerns were heard by county leaders and not forgotten and feel strongly that the upcoming treatment of mosquitoes should not cause issues with our bees and pollinators in Johnston County. 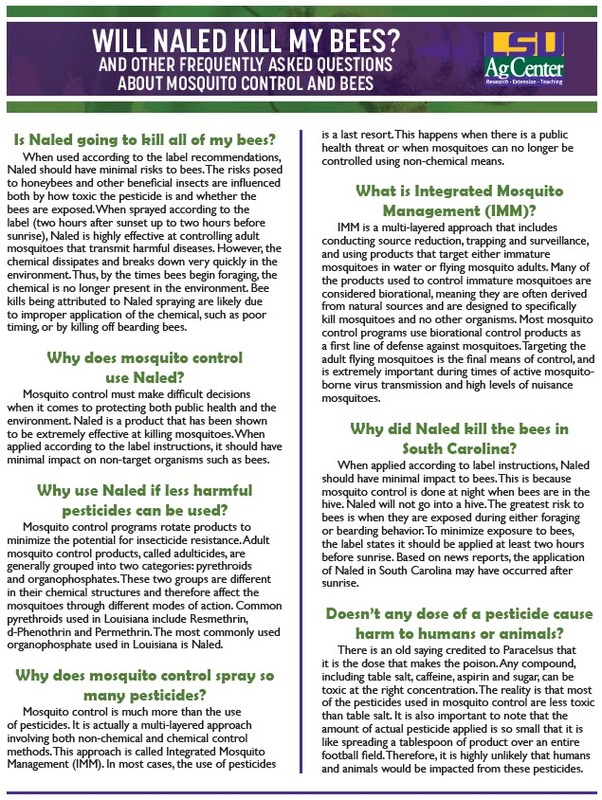 After talking and considering several options the county has decided to treat mosquitoes with aerial application using the product Naled. Based upon the information that we have been provided by contractors, labels, and other experts, Naled should have very limited impact to honeybees. This information is also supported by an attached document from the LSU Ag Center, a sister land grant university and a trusted source. The expected low-impact to bees is based upon the product being used according to the label. This means that the product will only be applied at night when it is dark and bees are not foraging. Pilots will take off just after dusk and cease application likely around 4 a.m. In addition, the product (Naled) is highly subject to photodegradation. So, within minutes of light exposure (sunrise) the product is inactivated and gone. Also, the contractors specialized spray equipment will produce extremely small droplets that will essentially hang in the air like smoke or fog with a very limited amount of the material ever reaching the ground. It affects mosquitoes through their contact with the material while flying. As with many pesticides you can find negative information concerning bees and Naled but please know that this product has been heavily studied for more than 50 years and is trusted and approved by the EPA and CDC for mosquito treatment with no issues to bees when used according to label. Cases of bee kills with Naled have been caused by off label application, but we do feel very strongly that VDCI (the contractor) is well qualified and has the proper equipment. They also come with references from other counties in NC that are doing similar abatement practices. Beekeepers in Johnston County and throughout NC are always encouraged to use Driftwatch to register areas where bees or sensitive crops may be located. The contractor is well aware of Driftwatch and they will use that as a tool to identify sensitive areas. In addition, some beekeepers are planning to cover hives with wet burlap. Based on what I have found, this is probably not very effective or necessary but some will likely do this anyway. The county will also do a good job of communicating through web (www.johnstonnc.com) and Facebook (www.facebook.com/johnstoncountygov) about where spraying will proceed each night. This will likely occur only once in a given part of the county and will likely be completed this Saturday through next Friday at the latest. It will likely take 3 to 4 nights weather permitting to cover the entire county. Previous article:David Tarpy on How to Protect Your Beehives From Mosquito Spraying Following a Hurricane.